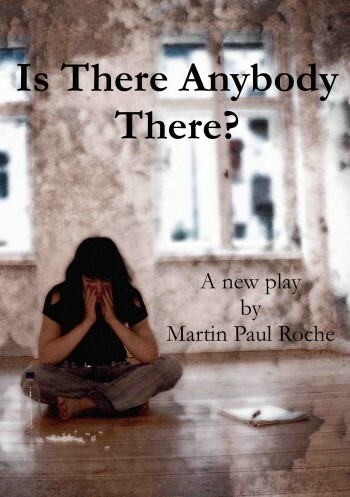 Martin Paul Roche - Is there anybody there? "Give us more of this writers plays ... the cast held me all the way through. Brilliant!" Sue has spent her life married to an empty space. A man who wasn’t ever there; not with her anyhow. And she fooled herself into thinking her manufactured life had been manufactured by her. But a perfect life is not always what it seems and her husband made her realise that. But life can bring with it unexpected turns and what begins as a joke soon becomes much more. It questions what motivates us, what we want out of life ... and what we think about what might come after it. It explores friendship and what we expect from it and then within the cracks between relationships, what is really going on and what happens when it goes wrong - and why. Finally, it considers those times when we are alone and assess our lives with that inner monologue we all rehearse; what part of us is actually speaking and what part answers us back? The journey the characters go on begins and ends in two very different places and the question of the piece is not resolved ... that is a matter for the audience to decide. What will you decide? Was anybody there? Sue: 35/45*. Attractive, slim. Always well, and expensively, dressed. She is self-assured, hard, bitter, in humour and in anger. Underneath and later, she is vulnerable, and her demons come home to roost. Ann: 35/45*. Business like, ‘safe’, initially, but there is a feeling that now and again, her character suggests that there is more to her, unexpected, uncharacteristic. In the beginning, she comes across as a person who sees in Sue an opportunity to be somebody very different, have a laugh, take risks. A trusted friend. But in resolution, she is dark, manipulative, chilling. The Woman: 35/45*. A complicated character and very difficult to read, judge, categorise who or what she is. She is controlled, unemotional, expressionless, detached, calm, precise, articulate. At no point is anything said which indicates the nature of what she represents. I think to have the audience never having any definitive answer is the crux of the piece; let them imagine who or what she is. For the premiere she was simply dressed: jeans, white T-shirt and bare feet. *No matter what, I would suggest that they all need to be a similar age and therefore, the playing ages of the actresses as a group, may be adjusted upwards to accommodate this. Their language and experiences would not, I would suggest, allow for them to have a playing age which is younger. The video illustrates the set for the premiere. "Really enjoyed last night. Great play, funny and dark at the same time. Highly recommended." "Brilliant in every way. Totally loved it. Well done to all of you. Martin has such excellent writing skills; I actually couldn't wait to get back in the theatre at the interval to see how things panned out. Totally awesome." "... give us more of this writers plays ... the cast held me all the way through. Brilliant!" "Seriously, the play was fabulous. Get down there this week." John Mercer, Tameside Reporter : "Twists and turns ... mysterious ... evocative ... makes you sit up and think ... haunting ... spine chilling. 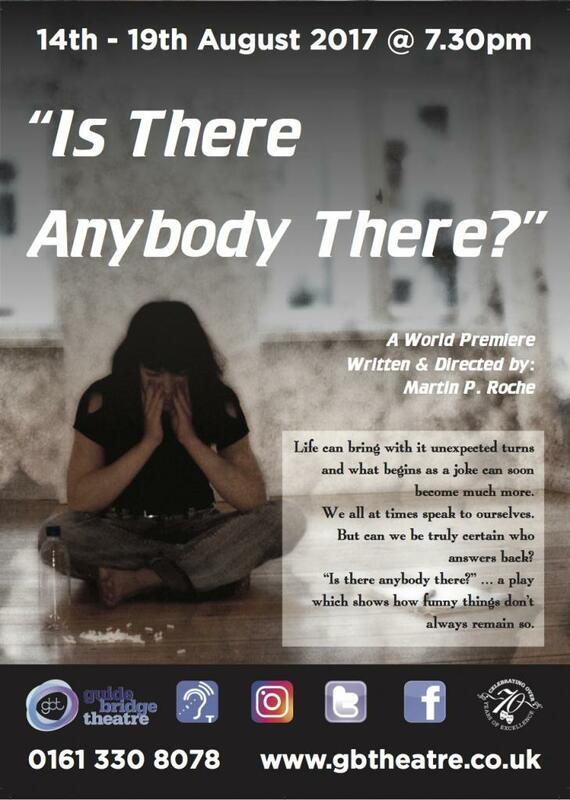 All in all, this is a great piece of theatre with lots of laughter..."
Sue Holden: "Is there anybody there - there certainly was. How great to see GBT with significant attendance for this play. Whilst I understand the drivers of artistic variety, and this may be controversial, but I believe plays which are engaging and entertaining are the mainstay of a local theatre group. I am not a connoisseur I just know what I Iike and I didn't just like this play I loved it. It had everything packed into one, comedy, tragedy, mystery and intrigue. It had me up and down like a roller coaster and each of the three performances was outstanding. The set and staging was brilliant. So GBT more plays like this please.With a final note to the generosity of the author in bringing this awesome play to GBT."